Thanks to your feedback, Swimia has grow to be in just various months one essentially the most critical web sites of swimming pools. Here you have all the info we know about centre pour handicapes, in Montreal. 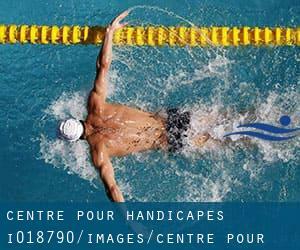 Don't neglect you can also promote this pool so centre pour handicapes will appear the first of Montreal, or perhaps the very first of your country, contact us to know more. Swimmers like you reported 25 meters, 5 lanes, Indoors. Write down the GPS coordinates we've on our file for this Pool, so you can enter them into your GPS to aid you locate the Swimming Pool easily. Updated on 2019 5115, rue des Galets , Saint Leonard , Montreal , QC , CANADA (Postal Code: H1R 3W6). Among all the activities offered by the centre, if you're considering swimming you can expect to appreciate 25 meters x 13.4 meters, 6 lanes, Indoors. If you need to contact this Swimming Pool, email address and phone number are both number. College de Rosemont , 6400 16th Avenue , Rosemont , Montreal , QC , CANADA (Postal Code: H1X 2S9). Among all of the activities offered by the centre, if you are thinking about swimming you are going to delight in 25 meters, Indoors. Just in case you want to get in touch with this Swimming Pool before dropping by, we only know the phone number. Updated on 2019 475 President Kennedy Avenue , Ville-Marie , Montreal , QC , CANADA (Postal Code: H3A 1J7). This sports centre gives 20 meters, 2 lanes, Indoors. For this Pool, only phone number is number here. 1600, rue de Drucourt , Rosemont/Petite-Partie , Montreal , QC , CANADA (Postal Code: H2G 1N6). Among all the activities supplied by the centre, if you're enthusiastic about swimming you might delight in 25 meters, Indoors. Just in case you want to contact this Pool just before dropping by, we only know the phone number. 4141 Rue Pierre-de-Coubertin , Hochelaga-Maisonneuve , Montreal , QC , CANADA (Postal Code: H1V 3N7). Few days ago a normal user of this centre told us they offer Olympic size x 25 meters, 10 lanes, Indoors. Furthermore, they keep in good conditions Olympic size, 5 lanes, Indoors. Contact details for this Pool similar to phone number and e-mail address are number. Updated on 2019 3950, Boulevard Saint-Laurent , Plateau Mont-Royal , Montreal , QC , CANADA (Postal Code: H2W 1Y3). Among all of the activities offered by the centre, should you be considering swimming you might enjoy 25 yards, Indoors. Just in case you need to contact this Swimming Pool before dropping by, we only know the phone number. Updated on 2019 400, avenue Ball , Villeray - Saint-Michel - Parc-Extension , Montreal , QC , CANADA (Postal Code: H3N 1H7). Swimmers like you reported 25 meters, Indoors. Unfortunately we do not have the email address of this Pool, but we can give you the phone number. 6105, ave du Boise , Outremont , Montreal , QC , CANADA (Postal Code: H3S 2V9). Swimmers like you reported 18 meters, 4 lanes, Indoors. Unfortunately we do not have the email address of this Pool, but we can give you the phone number. Updated on 2019 955, rue Marie-Anne Est , Plateau Mont-Royal , Montreal , QC , CANADA (Postal Code: H2J 2C8). Swimmers like you reported 25 yards x 10 yards, Indoors. Unfortunately we do not have the e-mail address of this Pool, but we can provide you with the phone number. Complexe Guy-Favreau , 200 Boulevard René-Lévesque West , Ville-Marie , Montreal , QC , CANADA (Postal Code: H2Z 1X4). This sports centre gives 20 meters, 5 lanes, Indoors. For this Pool, only phone number is number here. 12125, rue Notre-Dame , Mercier-Hochelaga-Maisonneuve , Montreal , QC , CANADA (Postal Code: H1B 2Y9). Swimmers like you reported 25 meters, 6 lanes, Indoors. Phone number and e-mail address are number for this Pool. 4585, Rue Sherbrooke , Westmount , Montreal , QC , CANADA (Postal Code: H3Z 1E9). Among all the activities offered by the centre, if you're considering swimming you can expect to appreciate 25 meters, 5 lanes, Indoors. Just in case you need to contact this Swimming Pool before dropping by, we only know the phone number. Updated on 2019 21,275 Lakeshore Road , Sainte Anne de Bellevue , Montreal , QC , CANADA (Postal Code: H9X 3L9). This sports centre delivers 25 meters, 6 lanes, Indoors. Contact information for this Swimming Pool such as phone number and email address are number. 2100 Édouard-Montpetit Boulevard , Côte-des-Neiges , Montreal , QC , CANADA (Postal Code: H3T 1J4). This sports centre gives Olympic size, 8 lanes, Indoors. For this Pool, only phone number is number here. Updated on 2019 475 Pine Avenue West , Ville-Marie , Montreal , QC , CANADA (Postal Code: H2W 1S4). This sports centre provides 25 meters, 8 lanes, Indoors. For this Swimming Pool, only phone number is number here.